HAS NO PAST AND NO FUTURE ... By: Dr G Bekele / PDF . 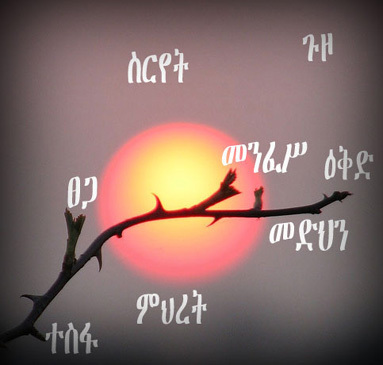 *** ብርቱካን ተፈታች የምልበት ቀን. . .
ሐምሌ 17 ቀን 2000 - ሐምሌ 17 ቀን 2001 ዓ.ም. የፀጋዬ ደረ-ገፅ ሰይሞታል ! ! ! and honoring his 70th birthday. am not a poet but i just wrote it when the bad news hit me and it was hard. Living his life by pruning and watering just to save heaps. Left are only silly, dictates and tyrants. Why don't you Ethiopia just keep the best? And all you can do is leave the rest. For millions like me who keep their eyes wide open. For ever and ever after you gone. This is a Remembrance of his 70th Birthday. Can you rest in peace? Can you rest in peace ever after you gone? Can you rest in peace Tsegaye Dear? How would you ever rest in peace? "ጥበብ ይናፍቀኛል፣ ተቻችሎ የሚኖር ሕዝብ ያስቀናኛል፣ ድንቁርና ያስፈራኛል፣ጦርነት ያስጠላኛል"
"I crave for knowledge. I envy tolerant, peaceful folks. I am frightened by ignorance. I loathe violence "